It’s so easy to make this all-natural treat. 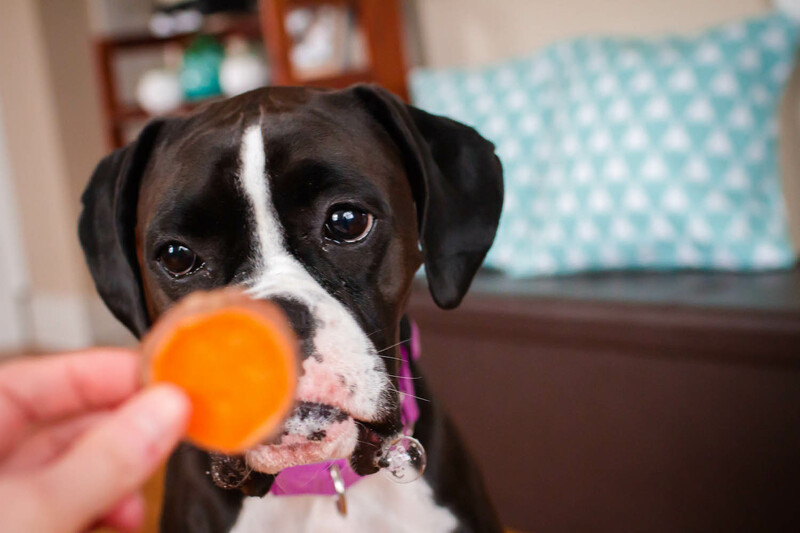 Your dog will love it because of its sweetness. You’ll love it because of the health benefits. Banjo is notorious for having digestive issues. She can be pretty picky about what she eats, especially when it comes to treats, but that doesn’t stop her from occasionally wolfing down something that’s going to cause a weeklong bout of diarrhea. And, as luck would have it, that’s exactly how we spent our last week. Not fun. A year ago, during a visit to Banjo’s veterinarian, I was advised to feed her sweet potatoes (instead of rice) when she has an upset stomach. The advice paid off, and it’s something I’ve relied on. So when Banjo was under the weather this week, I picked up sweet potatoes and mashed some into her food. To replace her usual treats, I also baked up some sweet potato chips. These healthy “chips” are baked, not fried. 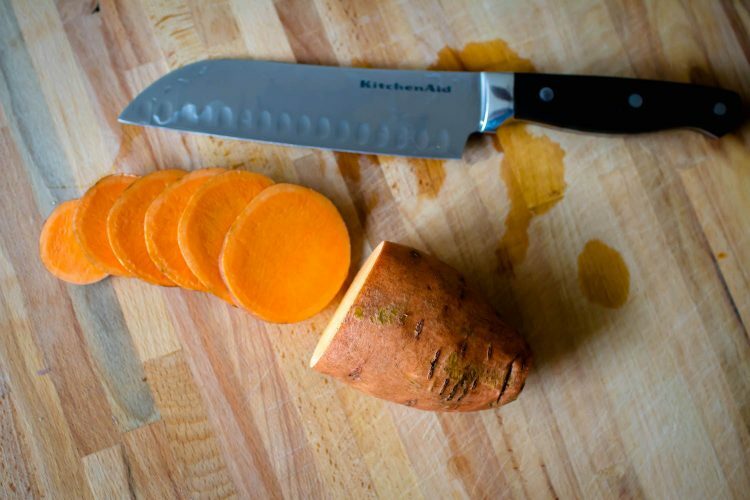 Cut the sweet potato into ⅛-inch slices. Line the slices on a nonstick baking sheet. 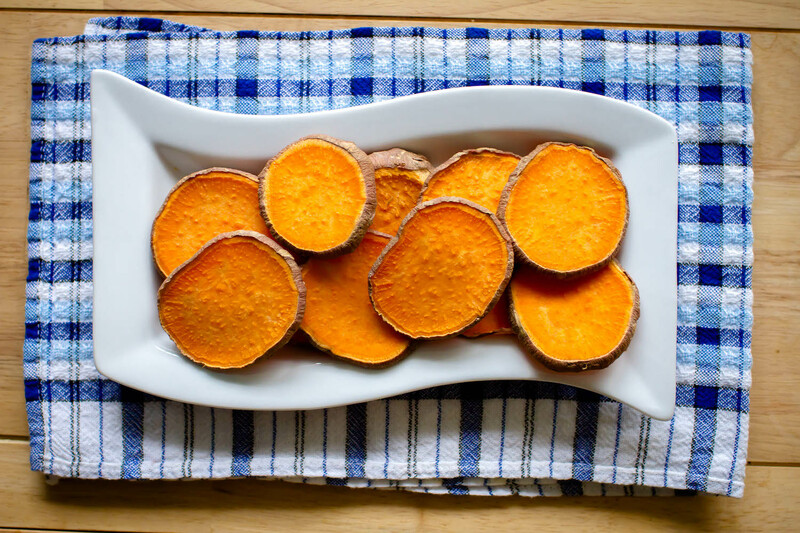 Cook for 25 minutes, flip the chips over, and cook for another 25–30 minutes or until shriveled and slightly Golden. Makes about 1½ dozen soft chips. Store extra treats in the refrigerator and use them up within 1–2 weeks. 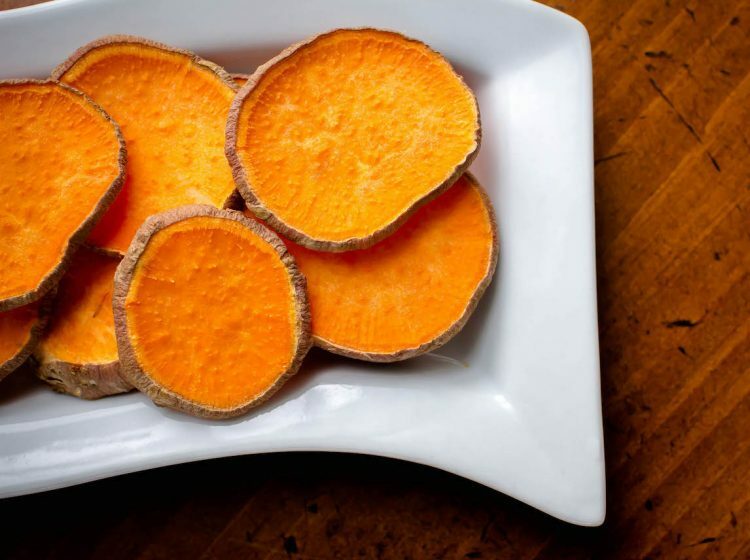 These veggies are so sweet, you won’t have to expend much energy trying to convince your dog to try them. Banjo loves this simple, all-natural homemade dog treat.